Sent from the UK, average delivery time 3 days from order. 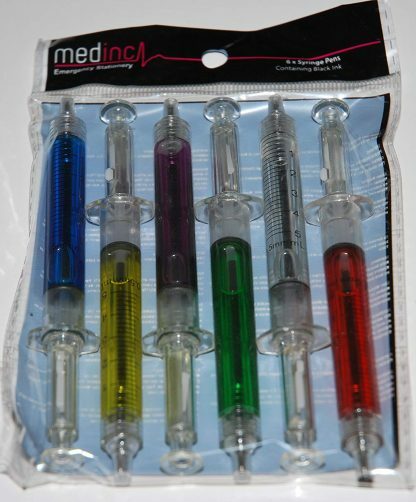 This awesome pack of 6 syringe pens is the best way to give the syringe pens as a gift. Each Syringe Pens Gift Pack has 6 different colours however all pens write in black ink. 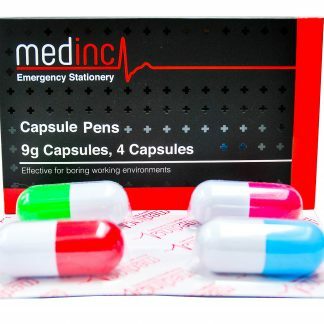 Medinc Syringe Pens Gift Pack write in black ink because all UK medical professionals are required to write in black ink. 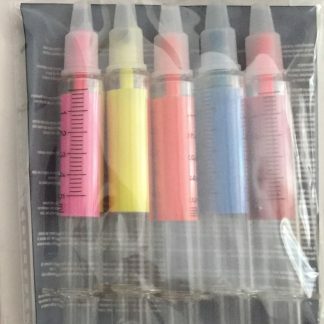 If you are looking for a totally unique and fun gift for someone working in a medical field then consider the Syringe Pens Gift Pack. The syringe pens gift pack can make a great gift for a doctor, a nurse or paramedic. 1 x Syringe Pens Gift Pack will contain 6 syringe pens. Each one has a different outer colour but all write in Black ink. The Syringe Pens Gift Pack is not a medical device and should not be used in emergency situations. It is strongly recommended that you do not attempt to ‘inject’ yourself with the Syringe Pens Gift Pack as it may cause injury. Please also be aware that using the Syringe Pens Gift Pack in public may cause distress. Some people find it hard to differentiate between an actual syringe and these pens. It is therefore recommended that you explain the pen to those around you before using it. Those of a sensitive nature can be offended by this item, please be considerate of their feelings. Would you like these pens but only want 1? Then why not consider Syringe Pen (Click here).